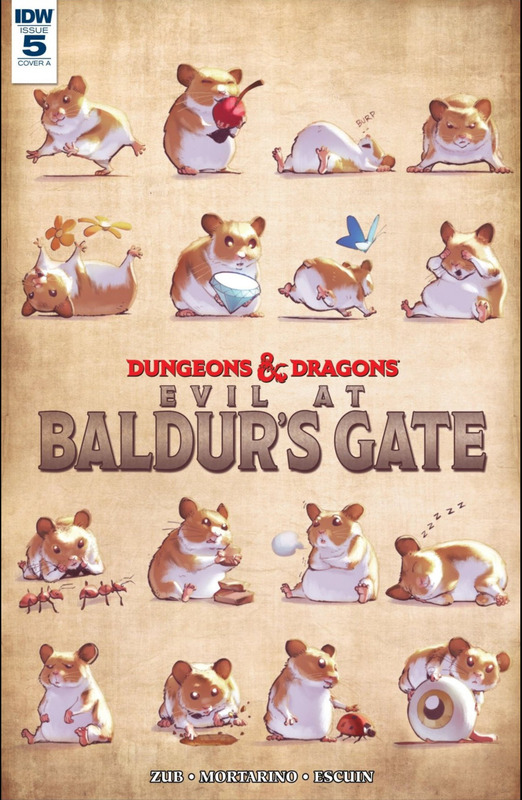 Just as effectively as a disintegrate spell, issue #5 of Dungeons & Dragons: Evil at Baldur’s Gate obliterated any lingering doubt we might have had that Boo, Minsc’s furry companion, was a ferocious, miniature space hamster. It’s not that we did not believe Minsc every time he reminded us that Boo was actually a giant miniature space hamster; it’s just that we’d more readily believe Minsc had his brains scrambled by a mind flayer. Then issue #5 starring Boo in his first solo adventure came out, and we are now taking Minsc’s constant bragging about his hamster companion’s prowess and intelligence way more seriously. 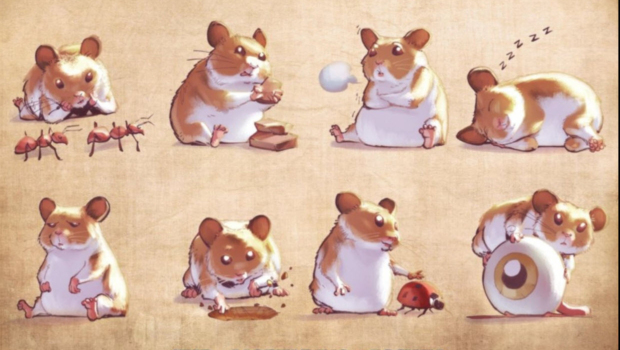 First off, the cover, which depicts Boo frolicking in various situations, is somewhat misleading because, while the book does dish out some cuteness, it’s mostly choke full of hamster ferociousness. I always love animal-centric stories, but then, let’s not forget that this is also Dungeons & Dragons, and that the cuteness will also be accompanied by some serious mayhem. 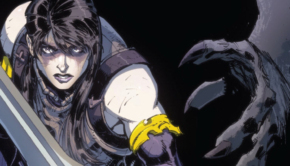 There has always been some humor mixed in with the Baldur’s Gate comic book, but this issue gives us a serious overdose of it, enough to make you want to read it at least twice. It’s hard to talk about the issue without giving away any spoilers. Let’s just say that Boo strikes out on his own one night and that havoc ensues. Most of the comedy is of the slapstick category, provided by a foursome of villains doing their best Dungeons & Dragons impression of The Three Stooges (plus one!). And it works. There is very little dialogue; the action speaks for itself. 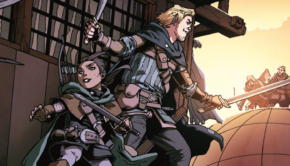 I’ve talked at length about the art and the writing on Baldur’s Gate in my reviews of the previous issues. So, I won’t have to repeat myself here. The quality is at par with what we’ve come to expect from this series. Like its predecessors, this issue will make a fine addition to any D&D fan’s comic book collection. Francesco Mortarino’s art and Jordi Escuin’s colors succeed in capturing the full onslaught of an enraged space hamster. 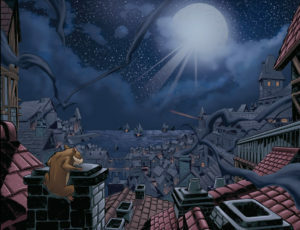 The splash page from the rooftops of Baldur’s Gate really brings the legendary city to life. If you’ve read the Baldur’s Gate novels, played the video games and adventured along the streets of this city in the role-playing game, it’s quite a thrill to see Baldur’s Gate depicted so well in the pages of a comic book. It’s a very cinematic issue, as it had to be in order to properly depict the martial prowess of a fully enraged miniature giant space hamster going amok on a bunch of bad guys. It’s no easy feat to keep readers entertained over several pages of hamster biting, physical humor that would make The Three Stooges proud and overall general mayhem, but the creators acquitted themselves very well. At one point, I almost felt sorry for the bad guys. 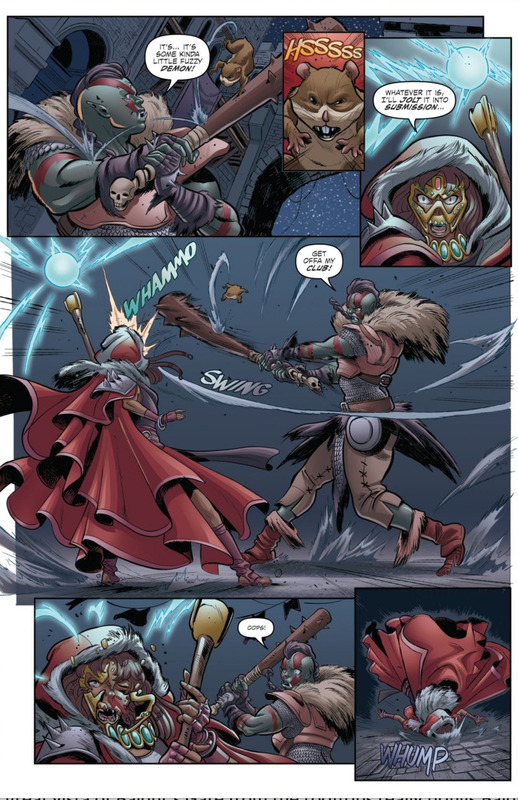 This is the last issue of the current Baldur’s Gate miniseries. 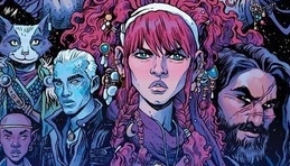 It provides a very satisfying conclusion to all five individual, self-contained stories spotlighting the various members of the Baldur’s Gate band of adventurers. I don’t know what is next for the Baldur’s Gate adventuring group, but I do hope that it is not the end of the adventure.